Exploding volcanoes can lead to torrents of coins in Aztec Diamonds. Created by GamesLab and NextGen Gaming, it’s a 5 reel, 30 payline video slot that comes with streak re-spins where the reels can expand to an 8×4 grid. There’s also a free spins feature. Play on your PC, tablet or mobile from between 30p and £90 per spin. GamesLab has kept things relatively simple on the design front. The action takes place against a backdrop of volcanoes and seas of larva. On the reels you’ll see brightly coloured A to 9 royal values as well as 4 higher value totem-style animals. The best of these is the bird. Land 5 of these in combination and you’ll pocket a payout of 16.66 times your total bet. Helping to create those winners is the golden idol which can hit on reels 2, 3, 4 or 5 only. 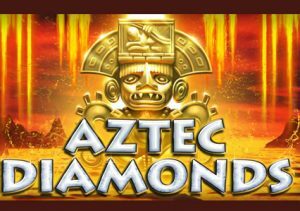 There are 2 features in Aztec Diamonds, both of which offer some very decent winning potential. Jackpot Diamond feature – land 6 diamond symbols on the same spin to activate this streak re-spin round. The diamonds are held and you’ll be awarded 3 re-spins. Any new diamond that hits is also held. If that’s in a corner position, the re-spins reset to 3. Hope to see diamonds fill all 4 corners as it leads to an expansion of the reels first to a 6×3 grid then 6×4 and even 8×4. Once all your re-spins have played out, all of the diamonds turn over to reveal a cash amount or a jackpot. All these are added together to deliver a final payout sum. The Grand Jackpot offers a 250 times bet prize! Free Spin feature – a prize of 2, 5 or 100 times your stake is awarded if you land 3, 4 or 5 of the volcano scatter on the same spin. You can also look forward to 6 free spins. During those free spins, extra wilds, volcano scatters and diamonds are added – you can also win 3 more free spins. Finally, you can trigger the Jackpot Diamond feature from within the free spins for even bigger payouts. There’s nothing overly flashy about the design here. The colourful visuals and drum heavy backing track do the job perfectly well though. It’s the features that we liked though, especially the Jackpot Diamond feature. We like streak spins at the best of times so adding even more reels made it even better. The free spins, though not large in number, offer some solid potential too. As far as variance goes, we’re in the medium range so expect a balanced range on the payouts front. We liked Aztec Diamonds far more than we expected to. You’ll see better looking video slots than this. Get lucky with the diamonds and volcanoes and you could unleash an explosion of coins. I suggest you try other GamesLab/NextGen Gaming collaborations with Cat Burglar and Osiris recommended.